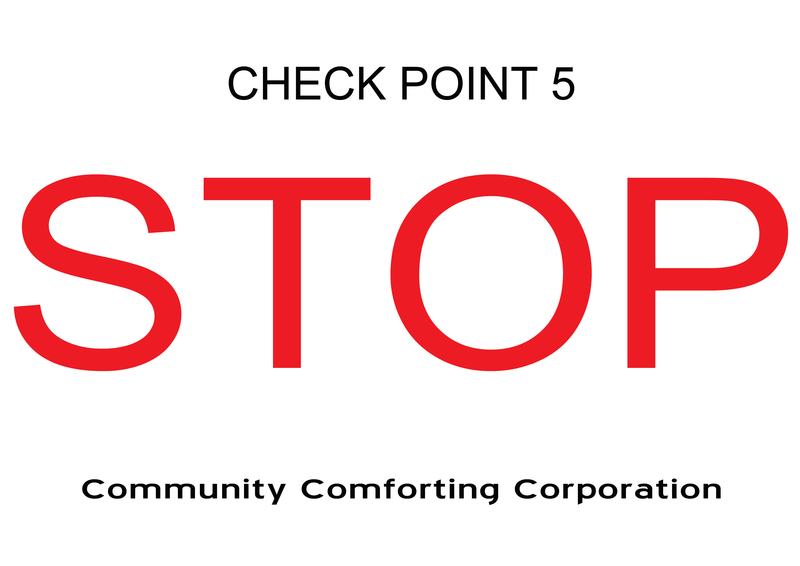 The Community Comforting Corporation, Checkpoint 5, was a response to the artist’s brief of ‘Borders’. The attack on Gaza and the way in which Palestinians are monitored across border crossings had made me think about all sorts of ways in which we allow monitoring ‘for our own good’. The ubiquitous security checks at borders, buildings and airports are obvious. 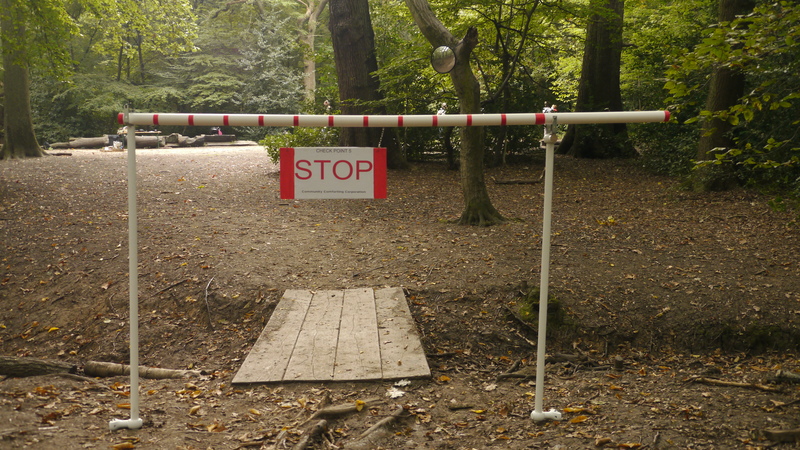 I wanted to set up the checkpoint in the woods, in a place which was unexpected. 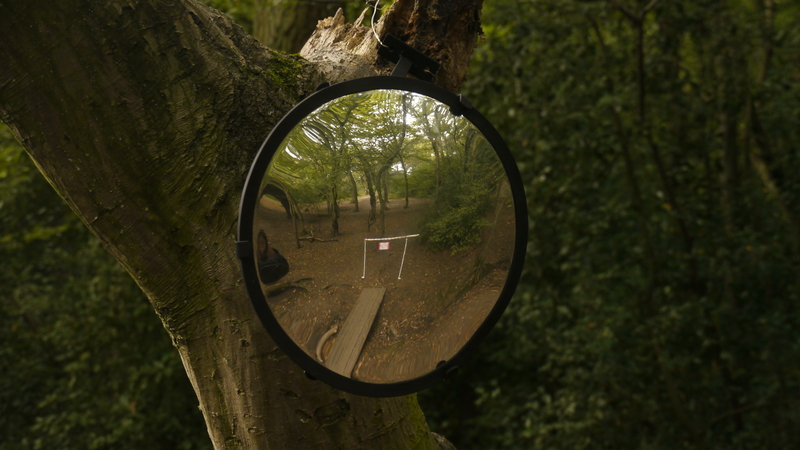 Immo Horn, my creative partner on this project, build a checkpoint, which we named ‘Checkpoint 5’ and Judith Brocklehurst from ReKindle, kindly donated a shop surveillance mirror which we hung from the trees. I bought a cheap ‘spy surveillance kit’, comprised of a ‘metal detector, spy glasses and a surveillance camera embedded in a watch’. 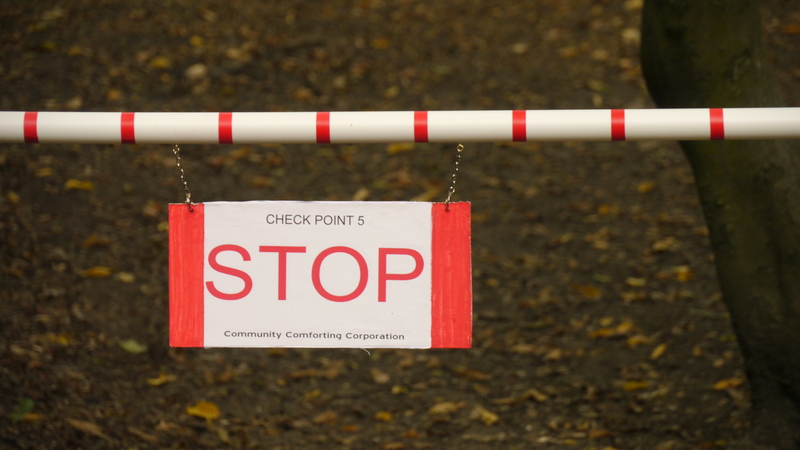 We set the checkpoint up on the sides of an old wooden bridge that people used to cross into the central clearing of the woods. There are other ways around, but this is a convenient point. Mostly people would have come to the park in pairs or groups, often with family members. So before I started running the metal detector over them, I would say, ‘ So who of you is the most troublesome? ‘, and the groups were always keen to point someone out. The metal detector might sometimes find the whole family troublesome, or even the one who was least expected, ‘ It’s always the quiet ones….’. I would then pull out a plastic bag, with a bar-code on it; ‘Please blow in here’. I thought afterwards that it would be fun to sell these ‘high ideals and crazy dreams’ back to them at a later stage – the way real corporations do, but we are still a small organisation…..
Immo would let them through the barrier, and then let through the people he had been keeping on his side and filming. We looked really sinister, but we were unfailing polite. All ‘Yes mam, No mam’. I thought of this woman who does the checkout at my local Sainsbury’s. She always says, ‘Hi Miss. How are you today Miss?’. She is friendly in a way that makes you suspicious that she is not taking the piss. In the middle of the afternoon, a group of teenagers started accosting us. ‘You can’t steal our high ideals and crazy dreams! We want them back….’ They kept it up for ages. I loved it. Good on you kids! I feel the future is much safer in your hands if this is how you will tackle the soft tyrannies of modernity! Those of you who were teenagers in the 80’s might recognise The New Age Steppers Song ‘High Ideals and Crazy Dreams’, I used as inspiration for my speech.